Vietnam and Cambodia are great places to visit. They are safe, the people are very friendly, the food is superb and I did not see a mosquito throughout my trip. This included a cruise on the Mekong and visits to the temples of Angkor. 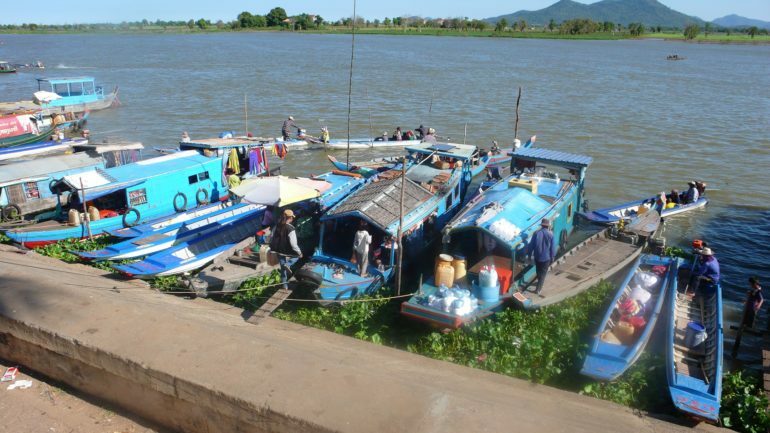 The best way of travelling from Vietnam to Cambodia or vice-versa is by boat along the Mekong, which takes about 8 days. Make no mistake, the Mekong is a seriously important river. It rises in Tibet and flows for 4,350 k. through China, Myanmar, Laos, Cambodia and Vietnam, making it the world’s 8th longest river. In parts it is two miles wide, and each year empties 475 billion cu. m. of water into the S. China Sea, and deposits fertile silt that adds 79 metres to the delta shoreline. It provides the main means of transportation between the two countries, and a living for 60 million people, largely from rice farming and, as it has more fish than any other river, from fishing. Vessels of all shapes and sizes travel north or south within their many different cargoes. 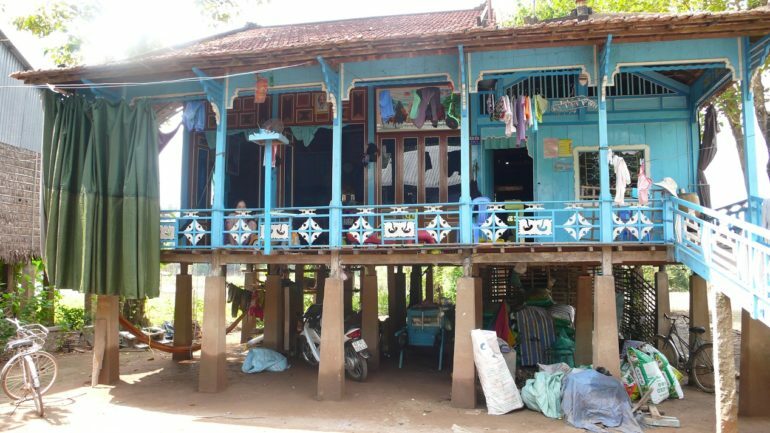 Villagers whose houses are on stilts, necessary when the river floods in the rainy season, call and wave as you pass, and there is always something to see as. Rather than a package holiday in which you have little choice of where you go and what you do, it is relatively easy to organise your own holiday. The best time to go is from October to March. If you can put up with the daily torrential downpour, although this might occur at night, August and September will enable you to enjoy benefits of being off-season. There are a number of cruise companies on the web, giving a choice of cruise duration, size of vessel and departure dates. 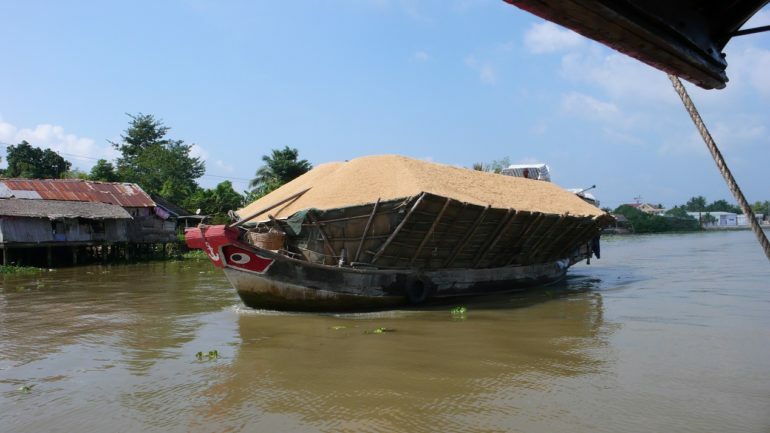 There are also private hire converted rice barges, some with only 4 cabins. I went on a 7 night cruise with AmaWaterways, an American based company, with most of the passengers being American. Its vessel the Ama Dara is the largest cruise ship on the River. It is 300 ft. long and has 62 cabins, all of which have showers, air conditioning and balconies, located on 3 decks at the stern half of the ship, with a large dining room, lounge and sundeck located in the front half. The food was of good quality, although not sourced locally. The itinerary included visits to local markets, riverside villages, silk, rattan and silver workshops and floating villages. The Cruise ended at a 5 hour coach journey to Siem Reap. Having selected the dates of your cruise, and whether you wish to cruise south or north, I strongly advise allowing time before or after you cruise to visit other parts of Vietnam and the temples of Angkor in Cambodia. By flying to/from Hanoi it is possible to visit Halong Bay and the ancient port of Hoi An which, although I did not visit them myself, were highly recommended to me by other travellers, as well as the beaches of Danang, Nha Trang and Mui Ne. Internal flights in Vietnam are inexpensive. Ho Chi Minh City (Saigon), from where you will be picked up by bus for the northbound cruise, is notorious for its frenetic traffic, and a safari riding on the back of a vintage vesper is one of its tourist attractions. The centre of District 1 is compact, with the Cathedral, magnificent old post office and Opera House and the state owned 5 star Rex Hotel all close together. The latter has 286 rooms, two restaurants and a roof garden. However, if you wish to stay somewhere quieter and on the river, the Villa Song Hotel has a speedboat ferry that will transport you in 15 minutes Bond style to and from the city centre. It has 23 bedrooms, 5 of which are suites, and is colonial in style. It has no lift but has rooms on the ground floor and up three steps. It has a riverside restaurant, complimentary breakfast available any time of the day or night, free mini-bar drinks and a large pool. The friendly manager speaks excellent English, and is happy to talk directly to you as to your requirements. He can organise a tour guide who will explain the history of Vietnam through art. Phnom Penh, the French built Cambodian Capital, is visited by most cruiseships for a day and a night, giving an opportunity to dine ashore. 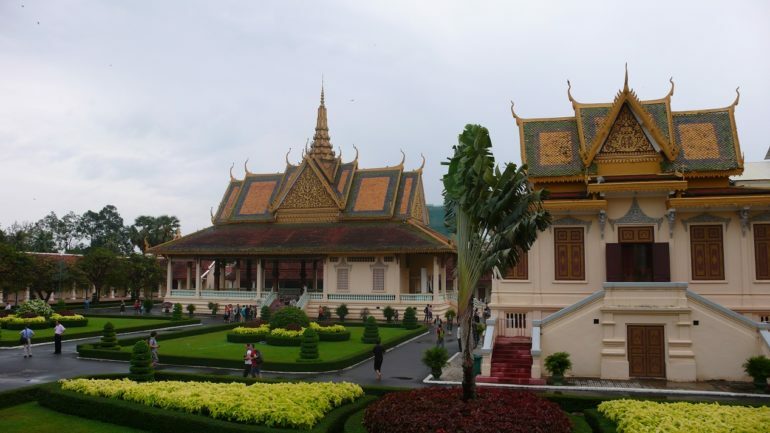 The Royal Palace, still occupied by the King, is magnificent, and the Silver Pagoda, so called because 5,000 of its floor tiles are made of silver, contains a solid gold Buddha encrusted with 2000 diamonds. The Foreign Correspondent Club, overlooking the River, is a good place for a beer. It was here that the last days of Pol Pot were reported, prompting the American Ambassador to wire home that the Club had reopened and therefore things must be getting back to normal! 96% of the Cambodians are Buddhist and the Monastery at Oudong is spectacular. 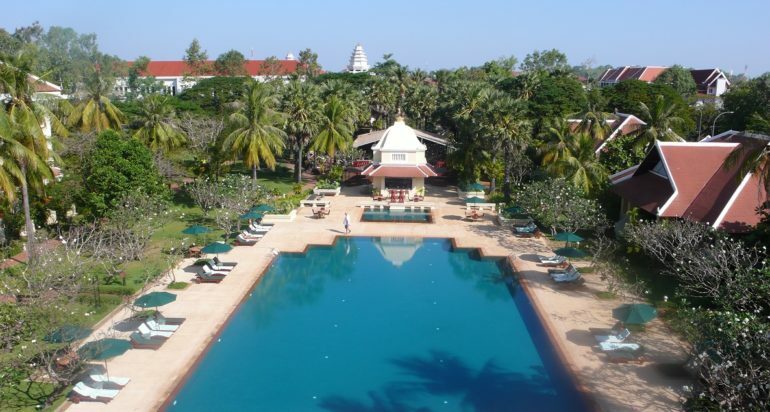 Siem Reap, a 5 hour bus trip from where the northbound cruise ends and the southbound starts, is Cambodia’s fastest growing city, with many 5 star hotels to cope with the 5 million visitors annually to the 139 Angkor Temples. 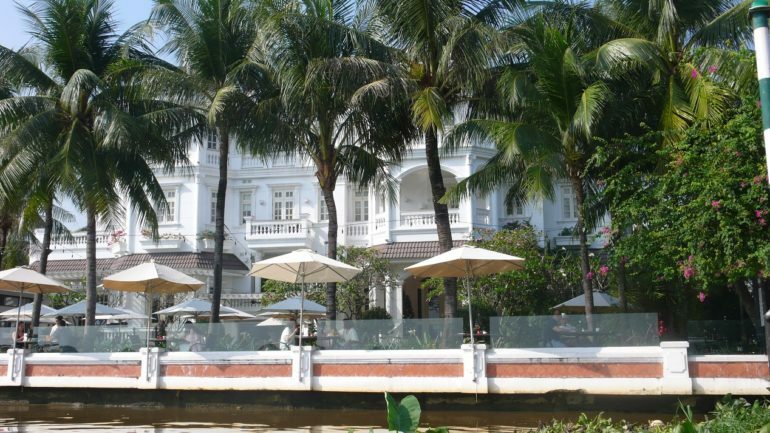 Standing on its own, both geographically near the Royal Palace and the Angkor National Museum, in the charming Le Grand Hotel, now run by the Raffles group. Built in 1929, it has its original Otis lift that was the first in S.E Asia, which is still used. The 119 rooms provide a range of accommodation, which the French manager is willing to discuss with you personally. There are two 2 bedroom villas that include a large living room and private terrace next to the impressive 50 metre swimming pool. The head chef runs a half day cookery course which starts with a visit to the market to buy ingredients, followed by meal preparation. Siem Reap also has a Foreign Correspondents Club next to the river, many restaurants, a downtown area known as Pub Street, an extensive night market, an arts and crafts market and a charming shopping street called Kandal Village. 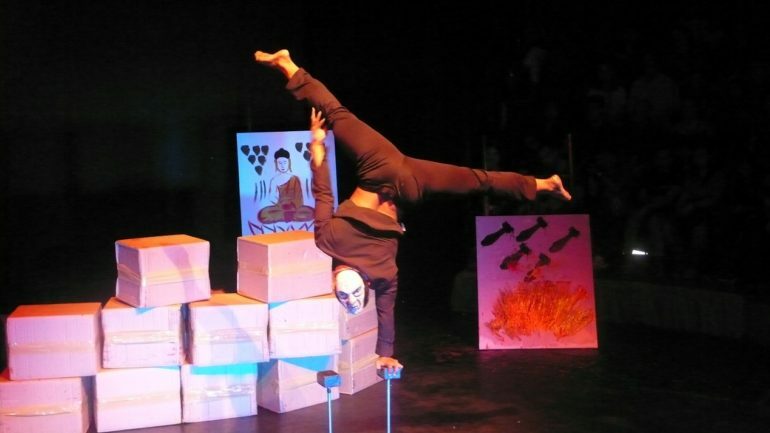 A must is a visit to the Cambodian circus, with acrobats that tell a story. It is a good idea to book tickets for this before leaving the UK. Horse riding and Ziplines are also available. As for the Angkor Temples, they can be viewed from a hot air balloon or helicopter, but need also to be visited on foot. A three-day pass costs US$62. I highly recommend first visiting the Museum, which includes a room displaying 1,000 Buddhas made from gold, copper, wood, stone and marble, which is simply breathtaking. The Temples are accessible by tuk-tuk and it is worth hiring a guide. I recommend visiting at lunchtime when many of the tourists have returned to their hotels. 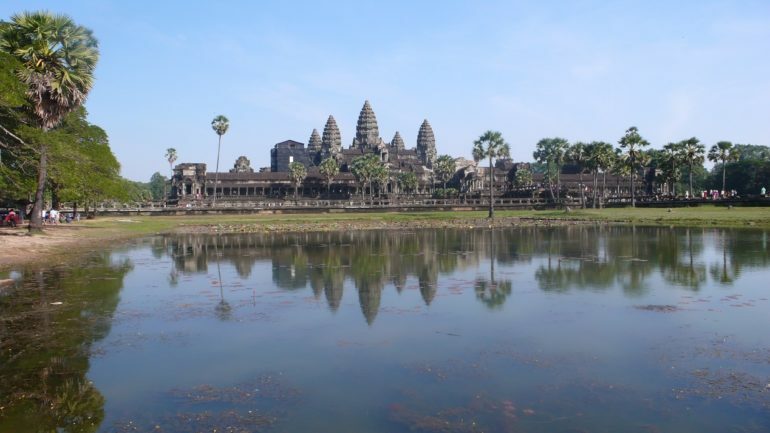 The Angkor Wat Temple with its 65 metre high lotus flower shaped towers, reflected in the moat, is iconic. Most stunning is its stone carved bass relief; some 2.5 metres high and 298 metres long carved into the external walls of the Temple, depicting Vishnu and his various victories. Not one inch of the frieze is without a carving, and whether the carvers worked from top to bottom or left to right, and whether they had any pattern to work from, is a mystery. It is not difficult to accept that 12th Century Angkor was considered the symbolic centre of the universe, as well as the centre of trade between India and China. The Ta Prohm Temple, discovered hidden by the jungle in 1860 is remarkable. A number of the silk cotton trees, whose branches and roots enveloped the buildings, have been left, leaving a location used for the film Tomb Raider. The locals now refer to this as the Angelina Jolie temple. Equally impressive is the Angkor Thom Temple, with its 54 towers, each of which has four faces of Buddha, portraying equanimity, loving kindness, sympathy and compassion. It has a perhaps an even more impressive and longer stone frieze depicting the King’s great victories. There is no doubt that the Temples of Angkor are in that small category of buildings, such as the Taj Mahal, that cannot adequately be described and have to be visited, and it is important to allow enough time to do so. These countries are still recovering from the war and death with which until comparatively recently they were associated, and their poor but dignified and hardworking and friendly inhabitants are to be congratulated in creating a beautiful and presently unspoilt tourist destination on or near the banks of the mighty Mekong. Villa Song: Manager: Yega Thiygarajan: yega.thiyagarajan@villasong.com +84837446090. Ask for river view. Le Grand Hotel. Manager: Vincent Vernigan: vincent.gernigan@raffles.com. Sarem. English speaking driver who is reliable and safe and can be quickly contacted by your hotel.